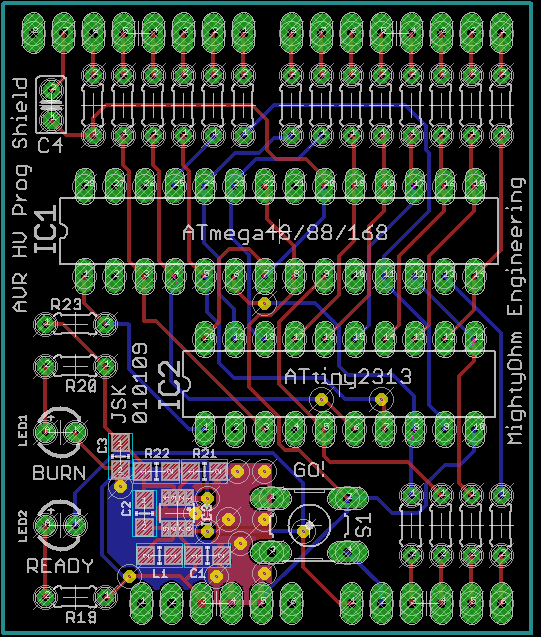 AVR HV Programmer Shield in the Works! In response to the continued demand for a PCB version of my Arduino-based AVR High Voltage Programmer, I just released a first cut to BatchPCB and should have a prototype within 3-4 weeks. I hope to have kits for sale in early February. Sorry for the delay in getting these made, but I wanted to make the best possible shield I could! Interresting project! Especialy with the ATTiny2313 on board. But the project started as a fix for a programmed RSTDISBL fuse bit. I have an ATTiny2313 with this problem and I’m trying to fix it. But I can’t get this chip in the HV parallel programming mode. In the product documentation there is an errata paragraph. There you can read that the Parallel Programming does not work on an ATTiny2313 rev. B. How do I determine the revision number from an Atmel chip? And has anyone succesfully fixed the RSTDISBL problem? I’d used debugWire on some 168’s, and was hoping to resurrect them using this method. I’ve build this circuit on a breadboard, but am not having a lot of luck. I built it, traced the lines, fixed a line that was out of place, and now the LED acts as described, but I’m not getting a reset chip. One potential cause: where does a 0v connection from the 12V supply go? I’ve got it connected to the 0V from the Arduino(duemilanove) at the moment, so the gnd for both are tied together. This seems wrong to me as it’s mixing two electrical systems (USB to my Arduino and then to my computer, and 12V wall wart), but I’m not sure where else it could go. Will this circuit work if debugWire has been turned on? Great news Jeff – I WILL be looking forward to the offering. BE SURE to have a link here where I can place the order. Target price is under $20. Bare PCBs will be significantly less than that. I should have kits ready in about 2 weeks. Waiting for step up converters to show up. Good deal Jeff – we’ll be looking forward to the kit. Any idea of generall range for price yet? Finally got my BatchPCB order back. The quality is very good. It would be perfect except for a minor misalignment in the silkscreen – nothing to get upset about. Via alignment is very good (I have heard this can be an issue). For my next order I’m going to just order one panel direct from Gold Phoenix. This time I need more boards so the quantity justifies a full panel. Hello Jeff, Your last post was Jan 6th, it’s now Feb 5th – what is the current status of the AVR HV Programmer Shield? I’m VERY Interested in this. I was just getting ready to start building, then realized you were releasing a product. Any idea of the time frame? Price? Kit or finished product? will only the PCB be available? You’ll have to thank BatchPCB for the delay. It has been a month now and still no boards. Apparently Chinese New Year caused some major delays. I may not use BatchPCB again because of this, although I admit they are pretty upfront about the loooong delays in getting boards so I knew what I was getting into. Once the shield gets back I need to make some minor changes to the code to support the new signal routing and the 2313, which should be fairly easy. I also need to test the stepup converter. 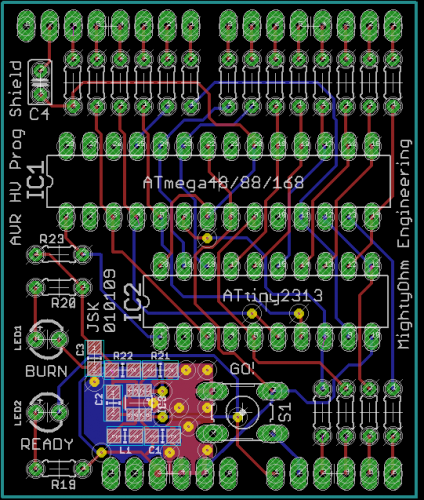 I’m going to sell a kit with PCB and all of the components you need to build up the board. I will post as soon as I have an update. I’ll release the schematics when the boards are back and tested. The code will also be updated to support the boards – the old code won’t work with these because of some minor tweaks in the routing and the new 12V supply. Please could you also post a schematic diagram of the new programmer … Thanks a lot!